I’ve done so much baking over the years, but this is the first time I’ve fully decorated a whole cake. 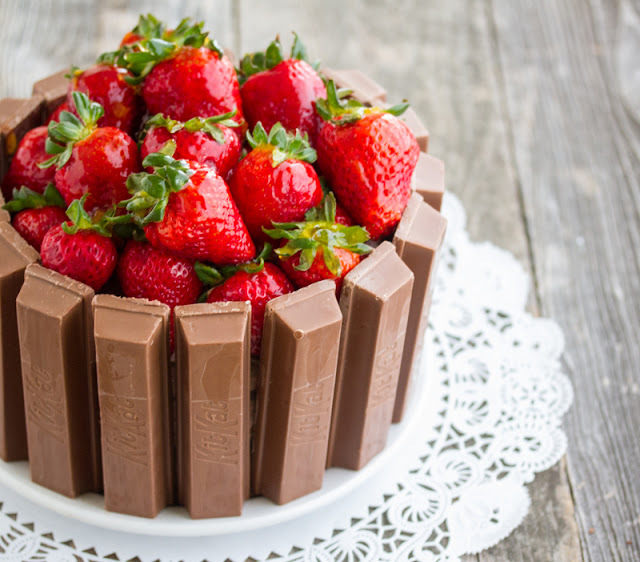 Of course, using kit kats makes it much easier but it also looks pretty cool too doesn’t it? I’ve been toying with doing a whole cake, completely with layers and decoration for a while. I was going to make one for DH’s birthday, but he asked for a very minimalist birthday this year. He wanted a weekend of doing nothing. No running errands, no making a mess in the kitchen. He wanted to sleep in, play his computer game, hang out and watch TV. Our downtime is usually quite busy, so I could understand why he wanted this break. So I honored his wishes and we did nothing for a day. It was actually a challenge for me because I am constantly on the go. Though by the end of the afternoon, I quite enjoyed doing nothing and had no desire to ever cook, work or clean again. Of course after his birthday was over, life resumed back to normal and my desire to make the cake was still there. I came across a design for a kit kat cake that I knew would fit him perfectly. He recently received some good news worth celebrating so it gave me the excuse to make him this cake. The kit kats represent the kid in him and the glazed strawberries are his favorite. I baked a regular chocolate cake, sliced it in half, did a chocolate whipped cream and fresh strawberries filling, then spread more whipped cream outside the cake before sticking on the kit kats and topping with piles of fresh strawberries. 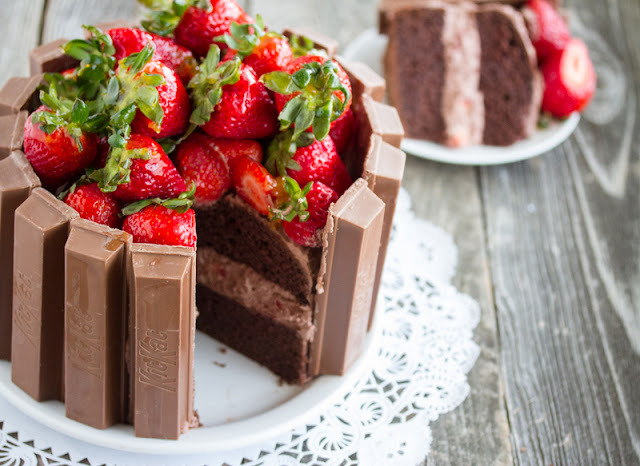 I had no idea how many kit kats would be needed for this cake. If you’re making it, be prepared to go through a lot! I actually used the extra large kit kats which I got from Costco Business Center. They are about double the width of a standard kit kat and I only baked a six inch cake, but I needed 17 of the large sticks to line the entire cake. 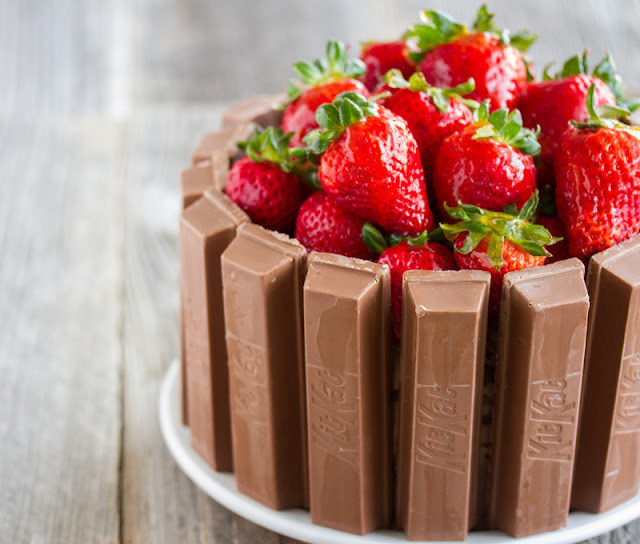 i can’t imagine how many regular kit kats would be needed on a standard 8 or 9 inch round cake. Even though the decorating is fairly simple, it did take about an hour or so to get everything on there. And the end result was super heavy! I surprised DH with the cake and he was thrilled. I was a little sad when we had to cut in and ruin the masterpiece. Oh well. Now that I’ve accomplished this one, I can’t wait to start making other fully decorated cakes. I really want to try the chinese sponge cakes with fresh fruit filling and whipped cream frosting. I also want to do a chocolate mousse cake for DH later as he loves chocolate mousse. 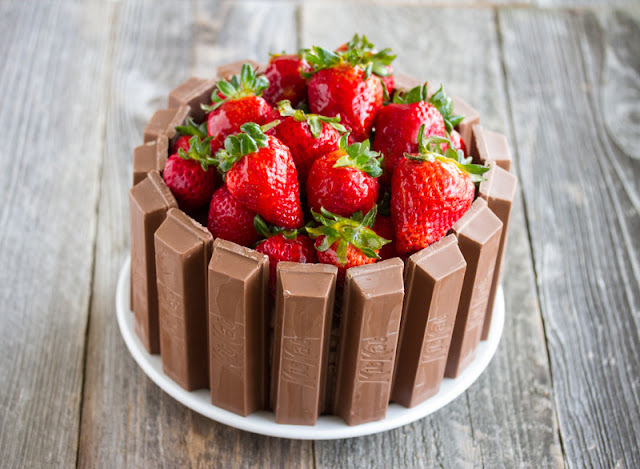 This cake has layers of whipped cream frosting, fresh strawberries and is decorated with Kit Kats! Bake cake according to instructions in a round springform pan or 2 round cake pans. Let cake cool completely. 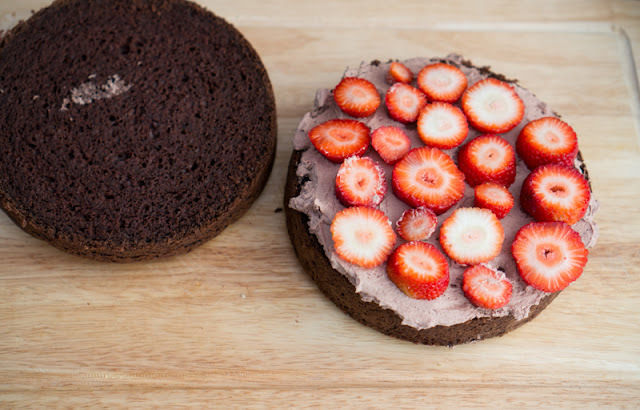 If you used one springform pan you will need to slice the cake to make two round cakes. If you baked in 2 round cake pans, gently slice uneven top surface so that you are working with two level round cakes. Make whipped cream by combining cream, sugar, and cocoa powder on high speed until stiff peaks form. You may want to add more sugar or cocoa powder, depending on your preference. I chose to use a less sweet whipped cream to balance out the kit kats and cake. 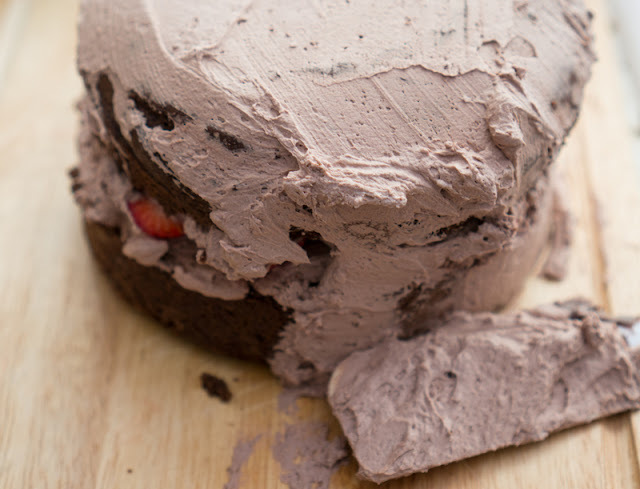 Using a spatula, spread a thin layer of whipped cream across the surface of one of the cake rounds. Slice up 6-7 strawberries and place on top of the whipped cream layer, scattering evenly across the cake surface. Spread another layer of whipped cream on top of the strawberries. Place the untouched cake round on top of the whipped cream layer. Using remaining whipped cream, spread across exterior of cake, until every part of the cake has a thin layer of whipped cream. Unwrap kit kats and press onto outside rim of cake until entire outside is lined with kit kats. The kit kats should hold their place with the help of the whipped cream. Fill the top of the cake with fresh strawberries (you can use other fruit as well). In a small saucepan, heat 1/2 cup apricot preserves with 2 tbsp of water until it begins to thicken and bubble. Strain out the apricot pieces. Brush strawberries with glaze. I used a really easy cake recipe but I actually thought it came out a little dry so I'm not sharing the recipe I used. You can use your favorite recipe or a boxed cake to make it even easier. That cake looks so awesome! Wish you had a bakery so I could buy a slice! Haha, I don’t think I could ever open a bakery. I feel so much pressure when I bake for others. A day in advance should be fine. The strawberries last longer if you coat them in the preserves. What a cute cake. Love it. Check out this kit kat cake I made for my son’s third Birthday. Your cake looks nice too! please make this for me.i will pay for it. i will pay for it be shipped in a refridgerated container overnight? P L E A S E! I’m sorry, but I do not ship and sell my baked items. Perhaps you can pay someone to make it for you. It’s not very hard to do. I posted this link to my mothers wall, and she made it for my birthday. IT IS SO GOOD! Not too rich, not too sweet, it was phenomenal. this is my first time trying to make cake. 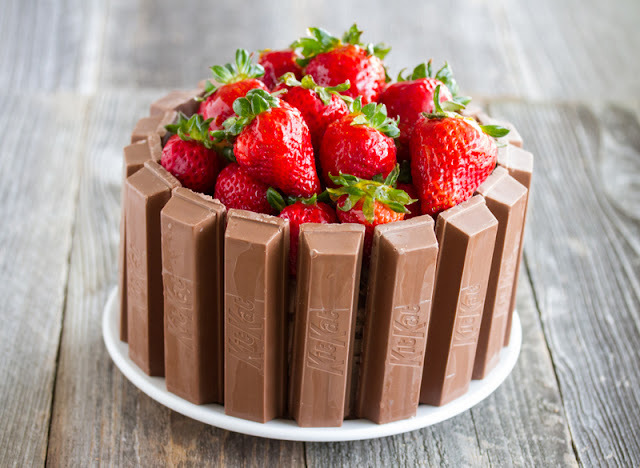 while placing kit kat onto rim of cake, did you put the cake on springform? and after finish decorating the cake, you bake on oven or cold it? 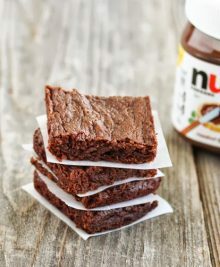 Hi, It looks really good, will make it soon ; ) I have a question on the type of sugar, is it regular sugar or powdered? Have you done anything similar with twix candy bars? Not sure if they would hold up the same way. Thoughts? I have not tried it with twix. I think it would work, though my two concerns are the height of the twix (aren’t they shorter than kit kats? even the large packs I remember are broken down into smaller ones), and the twix surfaces usually aren’t as smooth compared to a kit kat so it might not look as nice. Can I substitute a strawberry preserves or jam for the apricot in the glaze? Don’t know if the apricot affects the flavor of the strawberries and I am making for a picky eater. Well you can but it might affect how it looks. The shiny glaze uses a clear or light colored jam like apricot. If you use something like strawberry it won’t really look as much like a shiny glaze and will look more like a red coating over the berries. Does the apricot jam affect the flavor of the strawberries? Well it has a slight taste of apricots. The flavor of the jam doesn’t disappear or anything. I think it just makes the strawberries sweeter and fruitier. I love to bake and am excited to bake this cake this weekend..yours looks fabulous so I’m nervous mine may not come out as good looking as yours. I do love to bake so keeping my fingers crossed it comes out pretty. Good luck! I’m sure yours will come out great! I wonder you could use chocolate cool whip? I’m not sure. I haven’t worked with cool whip so I don’t know if it will melt. Aw, unfortunately no. But it’s pretty easy to make on your own! Hello! 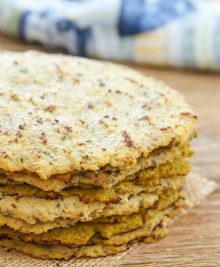 I spotted this on pinterest and thought it looked amazing and delicious, so I followed the link… and didn’t end up here. Instead I was on a site littered with ads. 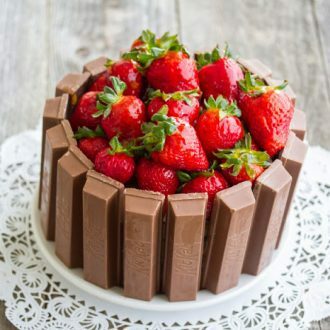 Thinking this was suspicious I google image searched ‘kit kat strawberry cake’ and found this post, clearly the original post. I thought you might like to know that you’re photos are being pinned from another source. I won’t link them here, as that gives them trackbacks but if you want it, mail me. Thank you for letting me know. I’ve reported the issue. 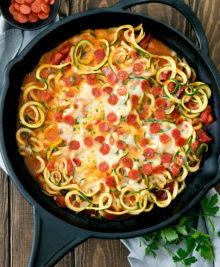 I actually found a few spam-type websites that took my photos and recipe without permission. 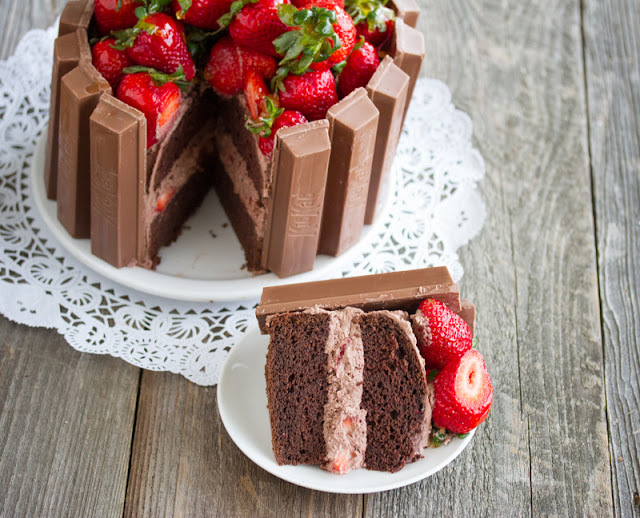 10 Full size Kit-Kat bars will cover an 8 inch cake! I know because I just did one! I bought a 6-pack of the full size bars since there is four Kit-Kat’s in a full size bar thinking it would be enough then had to go back and get another package which I ended up with two full size bars left. 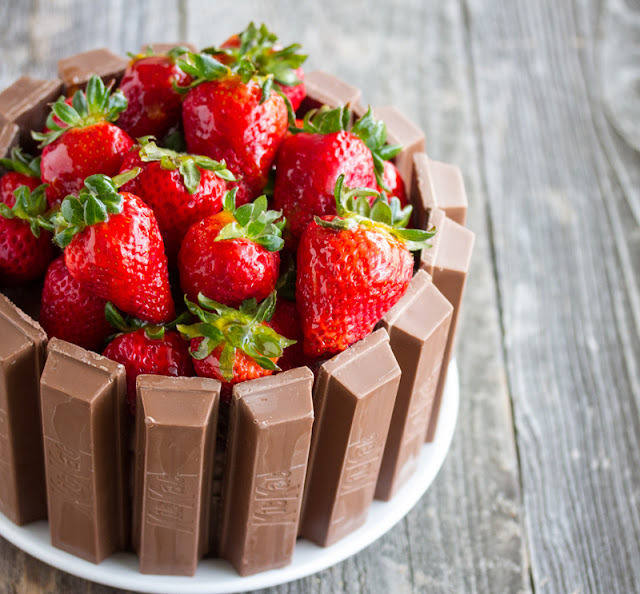 Hey, Im planning to make this cake tomorrow. Im confused in the icing tho. The heavy cream, is it the heavy whipping cream? I agree it’s really sweet, but it looks pretty cool! This looks so good! Real quick, how hard was it to cut? The kit kats and strawberries must’ve made it pretty hard I can imagine. It is a little hard to cut. I sliced between the kit kats so I wouldn’t have to slice through them. It will work. I found the jar frosting super sweet though so it’s up to you. This is so awesome! I think I will make it for our Valentines dinner for us & another couple! I hmade a Twix-M&M cake for Halloween & it went over big & was very good! try putting it in the fridge? Hi there! I’m so excited to make this for my kids this Valentine’s Day! I was wondering if I could just use cool whip and mix it with cocoa powder instead? I don’t have a mixer so in not sure what I should do instead. Thanks! I don’t use cool whip often, but I believe that it will likely melt and not hold its form the way that homemade whipped cream does. Thank you so much for sharing your beautiful cake. 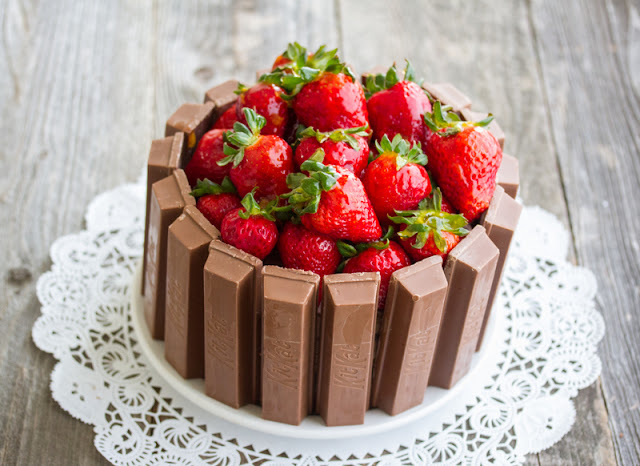 It was my sister’s birthday and she like chocolate strawberry cake so I baked this Kitkat cake for her. I got lots of compliments…. Wish I can show you my version of the cake. Thanks again!!! Did you take any photos? I’m so glad it turned out well! Yes…I do have pictures of my cake. How can I show You? How long can you leave the cake out on the counter? not too long because your kit kats will get stale. this is really more of a 1 day cake. My daughter pinned this to my board for me to make for her 19th bday-the recipe is well written & straight forward, i just have one question; do you really brush the glaze on AFTER the strawberries have been placed on the cake and not before? Thanks so much! You can do it either way. I did it after they were already on the cake, otherwise you’re touching and arranging sticky glazed strawberries. Hi, I was just wondering what kind of sugar you used, brown sugar or cane sugar? regular white granulated cane sugar. I made this awhile back for my friend’s birthday and it turned out awesome. I cut all the strawberries in half and placed them around in a symmetrical sort of floral pattern and it was a hit.